The President’s Cup final for class Premier trotters was the main attraction during yesterday’s 47th meeting of the season at the Marsa Racetrack. 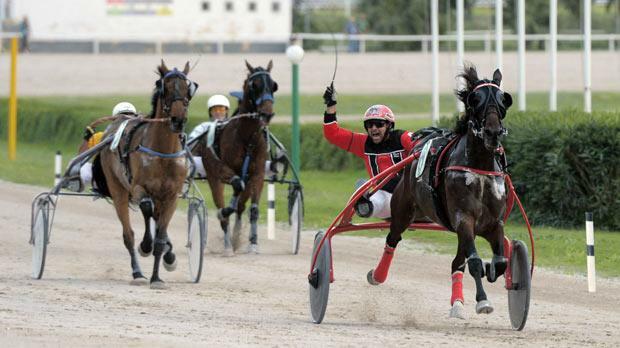 This final was held on a short distance of 2,140m and was won by Vasterbo Paradise driven by Gozitan Claudio Refalo. Yesterday’s card was scheduled to host nine races, but the last race, open for class Gold trotters, was later declared as void. Ten horses lined up for the class Premier final. It was Rio De Lou (Marvin Cauchi) which stormed ahead in the initial stages, building a small lead over Ohime Mag (Noel Baldacchino) and Vasterbo Paradise (Claudio Refalo). With 800m to go Noel Baldacchino put Ohime Mag in front but a few metres later this horse changed pace and was disqualified. In the final straight, Vasterbo Paradise dashed strongly from the outside to secure its second win in Malta from Rainbow Dancer (Michael Ellul) and favourite Nico Oland (Julian Farrugia). Rio De Lou finished fourth. At the end of this final, President Marie Louise Coleiro Preca presented the winning trophy to Claudio Refalo and Julian Bezzina driver and owner respectively of the winning horse. In this race, Vasterbo Paradise clocked an average time of 1.14.2” per kilometre. Yesterday’s programme also included a class Premier race on a long distance of 2,640m. The early leader, German Wee Catch Diamond (Julian Farrugia) ran out of steam midway through the final straight and was reeled in by Quattro d’Arline (Cliferty Calleja) which grabbed its third win of the season from Quetzal De Brix (Clint Vassallo) and Quiet Du Chene (Mario Fenech). Wee Catch Diamond finished fourth. The next meeting at the Marsa Racetrack will be held on Saturday. The first race should start at 12.20pm.